As much as we all love Aggie football, there’s one thing we dread when football season arrives – the gameday traffic around Kyle Field. We’ve worked closely with Texas A&M and the Texas A&M Transportation Institute to develop a cohesive plan to move traffic more efficiently after games. Under this plan, Wellborn Road is temporarily converted to four southbound lanes from George Bush Drive to Southwest Parkway, where it changes to three southbound lanes, then to FM 2818, where it returns to the normal two lanes. The contraflow lanes better accommodate the traffic from George Bush Drive, Kyle Field, and the Westside Parking Garage and allows easier access to nearby highways. One of our most congested roads after games is Holleman Drive between Wellborn Road and Harvey Mitchell Parkway (FM2818). If you’re headed to the southwest part of town, it’s best to bypass the right turn onto Holleman and continue south on Wellborn. You can then turn right on either Cain Road or Rock Prairie Road. Skipping Holleman will get you home sooner. In addition, we’ll begin closing streets and travel lanes at the beginning of the second quarter. Affected roadways should be closed and necessary traffic control devices in place by the beginning of the fourth quarter. 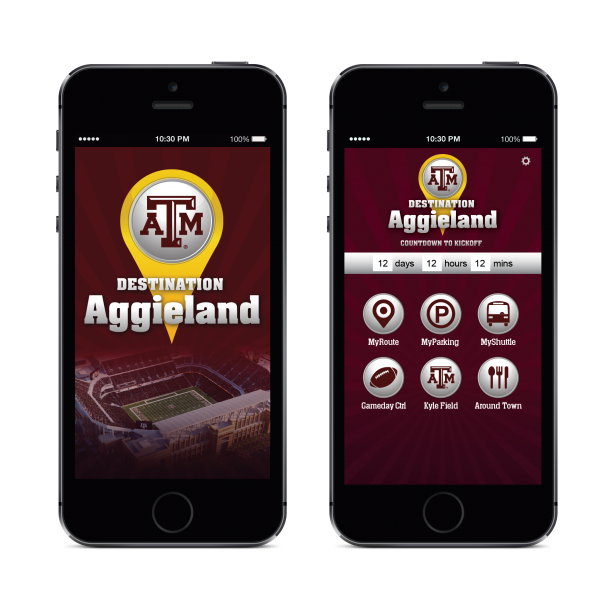 A free app called Destination Aggieland has real-time information on traffic, parking, shuttle routes, Kyle Field and what to do on game day. It even provides a countdown to the next Aggie football game. You can download the app from your favorite app store or at gameday.12thman.com. Click here for maps, shuttles and other information that will help move you around town as quickly as possible this season. Gig ’em, and BTHO postgame traffic! This entry was posted on September 8, 2015 by City of College Station. It was filed under Public Communications, Public Works and was tagged with Destination Aggieland, gameday traffic, Traffic.